Did you know that John Adams (our second American president) drank a tankard of cider before breakfast! If you have been making applesauce you may have extra juice from cooking the apples so how about making some home canned apple cider – I guarantee this will be better than the apple cider you might buy and oh, so much cheaper! If you choose the right apples it will be naturally sweet so no need to add any sugar. Choose a variety of apples for example Red Delicious, Gala, Fuji, Rome. Fuji and Gala apples give an aromatic flavor, and Honeycrisp and Pink Lady are sweet and full of flavor. Cider does taste better with a variety. You might need to experiment a little to get the flavor you like. 2. Use apples that have just been harvested (or close to being harvested) and cut out any bruises. 3. Once you have made it, store it in a cool dark place. You can pick your own, or buy them at the grocery store. Remember the fresher the better. You’ll get about 12 to 20 quarts of apple cider per bushel of apples. Count on 15 or 16 quarts per bushel. Wash the apples well to remove any chemicals and remove any bruised bits. Chopping them is much faster if you use one of those apple corer/segmenters – you just push it down on an apple and it cuts it into segments. Note: You do not peel the apples! You will put the entire apple into the pot to cook. Pretty simple put about 4 inches of water on the bottom of a huge, thick-bottomed pot. Put the lid on, and the heat on high. When it gets really going, turn it to medium high until the apples are soft through and through. Separate the liquid from the pulp, skins, seeds, stems, etc. There are quite a variety of ways to filter the apples. To get a more natural apple cider, put the cooked apples into a large metal or plastic sieve or colander. You can also refrigerate the juice for 24 to 48 hours and then Decant it (without mixing, carefully pour off clear liquid and discard sediment). Using several layers of a cheesecloth over a sieve, filter the juice. This could take a little while. If you would like a clear juice strain it through a paper coffee filter (placed inside the sieve or colander). If you want more filtered apple cider, use a jelly bag. Just pour hot prepared fruit pulp into a jelly bag and let it drip. . Do not squeeze the bag.! In my experience this method takes forever. Note: One of the easiest ways to extract juice is by using a steam juicer available at many hardware and variety stores. If you plan on making a lot of juice or doing this every year, it may be worth buying one. This unique piece of equipment allows you to conveniently extract juice by steaming the fruit which is held in a retaining basket. The juice drops into a reservoir which has a tube outlet for removal. Follow manufacturer’s instructions for using steam juicer. 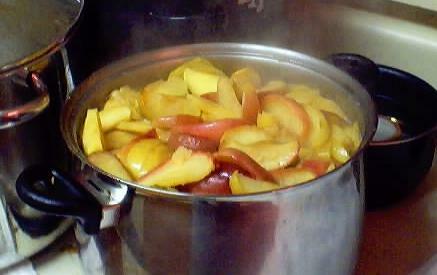 Put the apple cider into a large pot. If you want, add cinnamon to taste. You should not need to add any sugar. Fill them to within ¼-inch of the top, wipe any spilled apple cider of the top, seat the lid and tighten the ring around them. Put them in the canner and keep them cover with at least 1 or 2 inches of water and boiling. if you are at sea level (up to 1,000 ft) boil pint or quart jars for 5 minutes and half gallon jars for 10 min. This assumes you kept the juice hit until you filled the jars. Lift the jars out of the water and let them cool without touching or bumping them in a draft-free place (usually takes overnight) You can then remove the rings if you like, but if you leave them on, at least loosen them quite a bit, so they don’t rust in place due to trapped moisture. Once the jars are cool, you can check that they are sealed verifying that the lid has been sucked down. Apple cider will last around a year, but remember to keep in a dark, cool place.